"After driving for hours through blizzard conditions, I arrived finally at Althouse College for the 2nd Annual British Association of Teachers of Dancing Ballet, Stage and Highland Festival. I stood behind a group of dancers waiting to register. A tiny little girl of about 5 years old looked up at her mother who was trying to juggle dance forms, money and garment bags. With a tiny questioning voice the little one asked " Tell me gain, why am I here?" Looking outside at the miserable weather I wondered how many mothers and competitors would brave the elements? The two-day event started early Saturday morning and finished late Sunday Evening. The three adjudicators Cheryl-Lea London, Ontario Ballet and Stage Section, Heather Jolly, BC, Canada and Marguerite Reid, PA, USA Highland Section adjudicated 585 dancers and at least three times as many routines. Each discipline, Highland, Stage and Ballet prepared for their respective competitions. As dancers focused on warming up cold muscles, checking steps and routines, mothers ran for water, bobby pins, forgotten costumes; teachers were giving last minute instructions and pep talks. Here though the similarity ended. 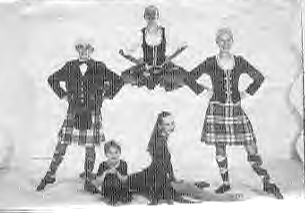 Highland dancers will tell you it is an extremely rare luxury to dance on a stage with back drops, lighting and comfortable seats for the audience. An audience that rarely sits still, I might add. Those things that ballet and stage performers accept as a given! Indoor Highland competitions usually end up in a church hall or gymnasium. Highland performers accept "this" as a given! Covering competitions, having to go from one performance area to another, the differences in ambiance, and the lack of facilities that Highland competitors routinely put up with became markedly apparent. I would suggest to all indoor competition organizers, before you grab that church hall of gymnasium, PLEASE for the sake of the dance and the dancers see if you can first find a venue that will add to the art form not detract from it. No mater how well a competition is presented or how well the dancer performs when the back drop is gymnasium doors, basket ball hoops and rubber mats it will lack audience appeal and ultimately respect (maybe another reason Highland audiences have no qualms at getting out of their seats, continually moving during performance) A performer can do so much more in the "right setting". Having the added distraction of glare from yellow lighting on shiny gym floors when trying to dance a sword, not to mention the injuries caused routinely by inadequate flooring (Highland dancers are not wearing Nike or Air Jordans on their feet remember, just tiny slips of leather). I saw some truly beautiful choreography that would have been even more special in the right arena. Luckily, the Stage and Ballet competition had a great venue and the brilliance of the costuming and the dancing shone across the footlights. How wonderful to see these young dancers lighting up the day and bringing joy to the many audience members (who didn't need to be told, although they were, not to leave their seats except in between numbers). The dancing made you forget the gray slushy skies and chilling wind outside. The little girl from the registration lobby arrived center stage wearing a purple leotard and tights and a smile almost as bit as she was. Cheryl-Lea gave her a gold for her performance but, you know from the look on her little face, she was still not too sure why she was there. But I know the smiles on the faces all around me told me why! The article continues with results. The London BATD Festival/Competition is still in existence. For further information or a contact person for the BATD Competition please contact me.